Welcome to the website for the Barnes Land at Wild Horse ranch. We hope you enjoy your stay. 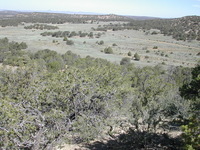 The Land is located in western New Mexico, northeast of Pie Town and south of Grants. (See regional map.) Lat: 107.90380W, Lon: 34.55138N. Wild Horse Ranch subdivision, phase 4, lot 79. Directions from Tucson Travel north on Oracle, which turns into route 77. In Globe, the road dead ends. Stay on 77 by turning left. In a couple miles, at a signal, you will need to turn right to stay on 77. Stay on the 77 to Show Low. The road from Globe to Show Low is also know as the 60; at Show Low continue following the 60 to Springerville, Quemado, and Pie Town. Now see the next section, Directions from the 60. Directions from the 60: Proceed to the extreme west of Pie Town. Take the 603 heading north. Though it starts out paved it quickly becomes a dirt road. After 3 miles there is a Y; bear right (east). Follow this dirt road for 17 miles, until you see a sign on the right (east) side of the road that says Wild Horse Ranch; turn right (east) on the dirt road. Travel east on the dirt road for six miles. (You will pass Amy Road and Jack Road.) Turn right (south) on Palomino Road. (See phase 4 map.) Follow Palomino Road, as it curves around, for 1.6-1.7 miles. (You will pass Alexis Road, Pippen Path, and Meghan's Trail.) Our driveway (a prominent two-wheel track) is on the right (south), less than 10 meters past a small, historic ranch building on our neighbor's property. You will see the the driveway wind through a break in the trees. You cannot see the trailer from Palomino Road. Directions from I-40: If arriving by plane, fly into Albuquerque, then drive west on the 40. Exit at highway 117, exit number 89. If you need gas, stop at Stuckey's, the last gas station before Wild Horse Ranch. Proceed south on the 117 for 30 miles. The Malpais lava flow will be to the right (west); spectacular sandstone bluffs will be to the left (east.) Just after mile marker 25, turn left (south) on a dirt road, C41. There are also signs for Wild Horse Ranch and York Ranch at the intersection. Travel south for 10 miles until you see a sign on the left (east) side of the road that says Wild Horse Ranch; turn left (east) on the dirt road. Travel east on the dirt road for six miles. (You will pass Amy Road and Jack Road.) Turn right (south) on Palomino Road. (See phase 4 map.) Follow Palomino Road, as it curves around, for 1.6-1.7 miles. (You will pass Alexis Road, Pippen Path, and Meghan's Trail.) Our driveway (a prominent two-wheel track) is on the right (south), just 10 meters past a small, historic ranch building on our neighbor's property. You will see the the driveway wind through a break in the trees. You cannot see the trailer from Palomino Road. Currently on the land is a 23 foot travel trailer, with a toilet, shower, sink, refrigerator, stove, oven, microwave, radio, dining table, sofa, and queen size bed. The dining table and sofa can also convert to small beds. Power is provided by two batteries and two propane gas tanks. There are electric lights in the trailer. Outside the trailer are a picnic table, a long table, plastic patio chairs, a gas barbeque, and a generator. The trailer has an awning, and there is also a stand-alone shade that may be erected by two people. When you arrive, you will want to fill the trailer with water. Until there is a well and well pump on the land, water may be obtained from the fire station. You may want to take the water hose and container from the trailer with you. Follow Palomino Road back to the main road (County road A-080) and then proceed east four more miles to the fire station, where there is a water spigot. Stand on opposite sides of shade. Grasp white frame. Walk backwards until shade is mostly opened. At each corner, push black corner up until the button pops into place. Fold blue velcro corners down into place. Slide out each leg to extend to full height. If desired, add on (via velcro) extra fabric panel for sun protection. Wrap up each blue corner, but do not remove completely. Push in the button inside the black plastic corner. Button is very stiff; try using a key. When all four buttons are released: Stand on opposite sides of shade. Grasp the white frame. Walk toward each other, collapsing the framework. Neatly fold in the blue fabric. Drop the stakes and the extra blue fabric inside the collapsed frame & fabric. Pull the cover over it and zip around the bottom. Store out of sun and weather. Attach sway control to car. Back car to hitch point. Use motor to lift trailer toungue. Connect chain to holes in hitch. Connect break-away switch -- loop one end through hole in hitch and slide the other in slot on trailer toungue. Use tool to pop sway bars onto ledge; insert pins. Use motor to bring up flat foot. Neatly stash outdoor furniture behind trailer. Empty fresh, gray, and black water tanks as appropriate. Leave several inches of water in the toilet to preserve the rubber seal. Remove personal belongings; stow remaining items as appropriate. Clean trailer interior; 409, glass cleaner, and rags are available. Close all windows and vents. With door open, push in slide-out. Collapse awning and shade; store the stand-alone shade in the trailer. Disconnect the batteries from the trailer.